This time around we stayed in Bangkok 10 nights total. We arrived from India on December 29 and then left by plane for Phuket on January 8. That seems like a long time, but it feels like it flew by. I already wrote about going to see the new Star Wars movie, visiting my favorite coffee shop in Bangkok called FOONG, and a crazy New Year’s Eve party in the street. I already talked about the weird culture shock I had going from northern India to Bangkok. I spent a lot of this trip to Bangkok writing and planning. I cranked out a half dozen blog posts one day, and got totally caught up on the story of our travels. I’m sure you missed some of them, so go check out the complete list if you care, and then come back to this one. Other than the things I already talked about, we did some exploring of the city, but approached it slightly more like people living there instead of tourists. We didn’t go to any of the temples or other cultural or historical tourist sites. Instead, we spent our time learning about various neighborhoods and things in them. Three of the days in Bangkok, Beth and I did set out to explore specific areas we’d read about but hadn’t seen yet. One day we took the Chao Phraya Express Boat – a sort of bus that goes up and down the river – up to visit the Wang Lang area, which is a dense market area near the Siriraj Hospital. We looked and looked for some shorts that Beth liked, but didn’t see anything. I got some street food, but didn’t need to buy anything, so I was just “window” shopping. It was at Wang Lang that we were first introduced to Thai banana pancakes (click link for video). Since then we’ve had them several times from several vendors. They are so yummy, and the banana makes us convinced they’re healthy. There’s fresh fruit right there! Another day, we took the BTS up to the Sukhumvit area and then walked around on foot. One of our guide books talks about this area being an expat hangout, and so we followed the “short cut” path drawn on the map. It was pretty boring, and even a little nerve-wracking, after dark. Sure enough we found a few Western style shops, including a Mexican restaurant (Sabroso) and a pastry shop (Mousses and Meringues), both of which were good. But most of the walk was just past shops that had closed for the night or residential areas. I guess exploring this area after dark isn’t too interesting. Part of this area has a lot of bars and prostitution, but we didn’t visit that part. That’s the famous Soi Cowboy, which we were near. But we were more interested in dessert than go-go bars. The next day we decided to go explore Chinatown. We took the Express Boat north to one of the Chinatown piers, got off, and started walking through the shops. There was some stuff going on right by the pier, but as we walked on we started passing things like banks and gold stores that either were already closed or were in the process of closing. We got to the main street, turned right, and found a place to get some food. This area was pretty hopping. Once we found the fabric market, we found that although the mall itself was open, all the shops inside were closed! So that was yet another bust. Here’s a nice blog article someone else wrote about what we would have seen there, during the day. We then walked down to the river, found a bar called Pakklong@The River, and had some drinks under a fan. There was some live music, a guy with a guitar playing cover tunes. It was nice having a very large, cold beer and watching the river boats go by. Here’s a strange thing that happened there. I ordered a Chang beer, one of the main two beers in Thailand. And there was a separate server in a green dress with the green Chang logo who did everything related to my beer. We had a regular server who did everything else – deal with Beth’s drinks and my other drink, take our money, etc. But the Chang server opened my beer, poured it, and whenever my glass was getting low, she would come back by and pour more from the big bottle into my glass. She never said anything to me, just poured beer. I assumed I wasn’t supposed to tip her separately, but I don’t know. There was a big Chang display and counter over at the side of the room, so I assumed she was there to promote her company’s brand of beer, and wasn’t an actual employee of the restaurant. Then we went to the Saphan Phut Night Bazar, which doesn’t open until 8:00. On the way there, we stumbled into a flower market which was just insane with activity. Beth got some photos, but I didn’t think to. Unfortunately, we soon learned that the night market only has about three types of shops, just repeated over and over about a thousand times. 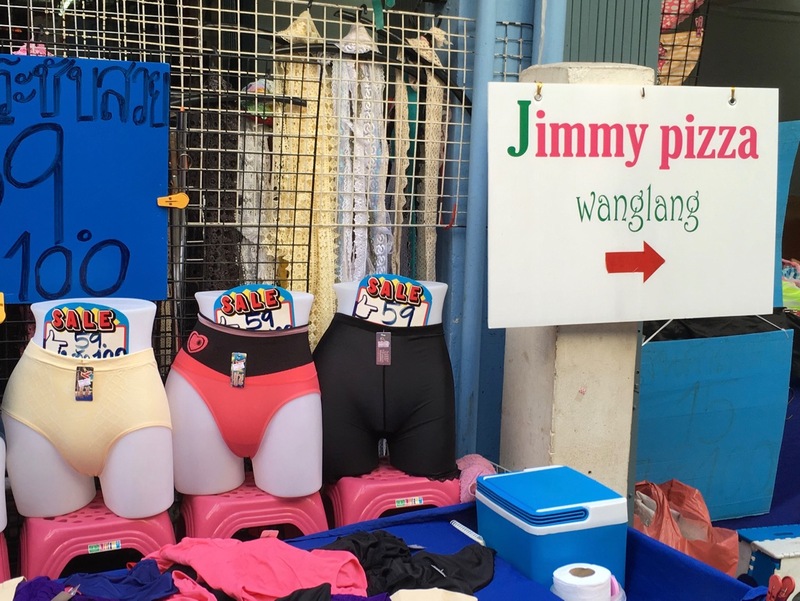 The first was hip clothing for 20-something Thai women. As you might imagine, the shorts at those shops weren’t what Beth was interested in. The second thing was tattoos. Apparently, one out of every three business transactions in this part of Bangkok is someone buying a tattoo, or at least a temporary tattoo or a henna tattoo. The third was mobile phone cases. If you want 100 places to buy the exact same mobile phone case for the same price, the night market is where to go. Anyhow, lesson learned: Chinatown also isn’t very interesting after dark. Overall, we’re getting the sense that if we want to go exploring, we need to do so much earlier in the day. Even with the reputation for night life, shopping in Bangkok happens much more on “normal business hours”. In India we got used to the idea that shops don’t even open until 10 or 11, and then stay open until 8 or 9. In Bangkok, it seems those same shops are open more like 9 to 6. That’s not to say that there isn’t stuff at night. Far from it! It’s just that if you don’t have a specific store in mine and want to just wander through a new neighborhood, do it in the day.